The Story: On a dark and stormy night, a married couple and their bemused third-wheel friend are forced to stay the night at a gloomy old home, inhabited by the very strange Femms, a family full of neuroses and dark secrets. See a movie called The Old Dark House and you think you know what to expect. Well, unless you’re psychic, half-mad yourself (you’d have to be to come up with this scenario), or have already seen it, you’d be dead wrong. Sure, there’s an old house on a hill. Okay, a bickering young couple and their friend wind up having to spend the night there. Yeah, the residents of the house are a bunch of freaks, weirdos, and psychopaths. But the devil’s in the details and if the outline sounds familiar, the details are anything but. Every line of dialogue, every gesture, every plot development is unexpected and off-the-wall. Who could predict the lesbian onslaught of sister Rebecca Femm (Eva Moore), pausing every now and then in her overbearing religiosity to a cop a feel from the heroine? Who would expect the appearance of 102-year-old Sir Roderick Femm, bedridden, cackling, and despite the misleading cast listing (actor’s name supposedly “John Dudgeon”) quite clearly an old lady with a scraggly beard glued to her wrinkly chin? And best of all, who should foresee the climactic revelation of Saul Femm (Brember Wills), outcast brother locked in his room for twenty years, set free to plead sanity – almost convincing us (we’ve certainly seen how nuts his siblings are) before the hero turns his back and Saul’s meek expression dissolves into a mask of fantastically cunning dementia? 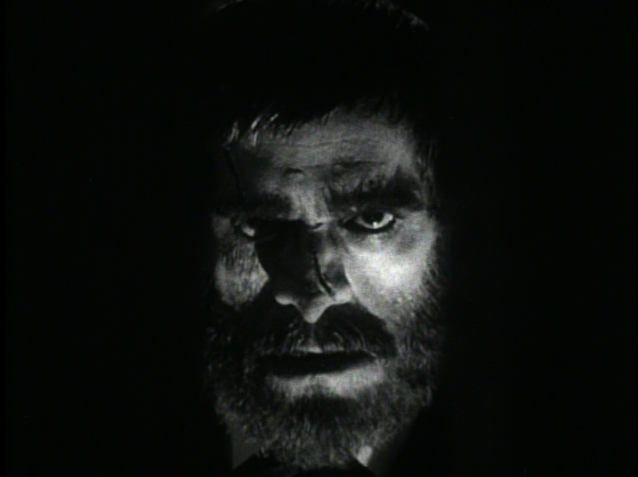 Certainly not J.B. Priestley, who wrote the tongue-in-cheek novel upon which The Old Dark House is based, in whose pages Saul appears as an fairly conventional madman (one review describes the book’s character as redundant, overlapping significantly with Morgan, the near-catatonic mute alcoholic butler played by Boris Karloff). Indeed, when one gets used to the wackiness of the characters, the movie’s attempts at Lost Generation philosophizing – cribbed from the book, which was apparently as much Hemingway as Poe – remain the The Old Dark House’s most bizarre attributes. One senses that Whale felt similarly and the actors’ delivery often undercuts the superficially somber tone of the dialogue; a supposedly riveting war story is cut to four purposefully glib words (“Then the war ended”), a ludicrous “cotton frock killed her” backstory is greeted with open smirks, and the absurdly accelerated meet-cute-to-marriage-proposal-in-five-minutes seems a parody of countless Hollywood romances. While a horror film and, to a certain extent (clearly intentional) a comedy, The Old Dark House is perhaps most at home in a kind of cross-genre category: the "in-joke" film, in which all the actors and filmmakers seem to be having a grand old time, while just barely managing to fulfill genre conventions and tell an involving story. Charade and Beat the Devil are films of a similar bent, to varying degrees; these are close cousins to the “hang-out” films Quentin Tarantino once celebrated (like Rio Bravo) and which Pauline Kael analyzed in her essay on the merits of trash. But whereas "hang-out" movies fit the loose jokiness within the narrative framework like a hand in glove, the “in-jokes” escalate our amusement by twisting and turning between purposes, one moment letting us think they are outright parodies, the next actually managing to make us fidget in suspense or recoil from creepiness. The key component in maintaining this are-they-or-aren't-they tone is the cast. The performances are almost all interesting; even some of the straight leads (often deadweight anchors to an offbeat film’s adventurousness) have charm. In addition to Karloff, who plays it straight and is actually kind of frightening, the real treats are: Wills in his cameo as Saul, all wounded pride and complete conviction (almost selling us on the idea that flames are really knives, and cold at that); Moore as Rebecca, in a performance so good it makes you wonder if, rather than find an especially talented actress, Whale et al. just cast a lascivious religious nut as herself; and finally, the man whom I saved for last, the scene-stealer, the triumphant king (or queen, rather) of punctuation and emphasis: Ernest Thesiger as Horace Femm, the first, best, and Femm-est Femm we meet. Horace is a prissy, glum, cuttingly witty old atheist, whose eyes, nose, and corners of the mouth communicate more than most actors' whole bodies. Thesiger always manages to take the most innocuous lines and make them spin so subtly, you'll find yourself in stitches without quite knowing why (most famously his wicked interpretation of “Have a potato.”) One of my favorite moments arrives when Charles Laughton, a natural scene-stealer meeting his match, crows, “There’s no accountin’ fer taste!” and Thesiger glares down his ski-slope nose at the broad slice of ham for exactly the right beat before issuing a snidely glum “No.” I don’t know if The Old Dark House is in good taste, but I’ll have another helping, please.